As well as being one of the first ever sci-fi talkies, William Cameron Menzies film of HG Wells’s Things to Come (1936) is notable for inaugurating a new wave of British film soundtrack composition. It was in this era, with Muir Mathieson as music director of Alexander Korda’s Denham Studios (later to become part of the Rank Organisation), that a number of important British composers of concert music began writing scores for the screen – notably Ralph Vaughan-Williams, William Walton, Arnold Bax, and Elisabeth Lutyens, along with Things to Come‘s own composer, Arthur Bliss. With Wells himself given an unprecedented level of control for a screenwriter, the music was placed in a position of paramount importance from the very beginning, and Bliss became involved in the earliest stages of pre-production. Unlike many concert composers who dip their toe into the murky waters of composing for film, Bliss maintained a markedly similar style to his usual music, and as a result the concert suite adapted from the film’s soundtrack remains popular to this day. Even if, as Wells desired and is sometimes reported, the music was not in fact recorded in advance of filming for onset playback, in certain sequences it is evident that the visual and musical aspects were conceived in parallel. In addition to the resources of a full symphony orchestra, Bliss also had at his disposal a specially enlarged percussion section. It is during the rebuilding of the city, with the operations of the great factories and blast furnaces, that this additional battery is exploited to its full potential, literally chiming with the machinery of production. However, with the City of the Future built, its newly erected skyscrapers glistening like Corbusier’s dream, Bliss’s music returns to the sort of bluff quasi-impressionistic Britishness heard in the film’s opening sections. With the forward march of scientific progress seemingly unstoppable, the film reaches its climax with a protest of artists and craftsmen against a proposed trip to the moon. You scientists, cry the artists led by the sculptor Theotocopulos, make our creations ‘look small’. 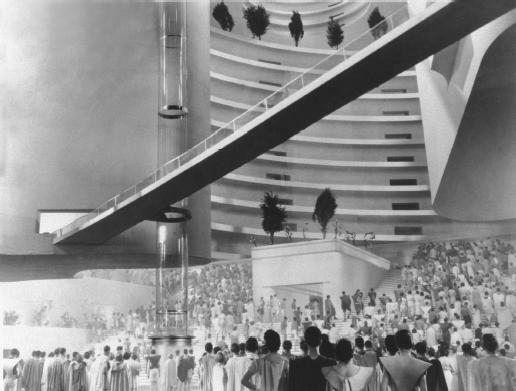 The reflexive sense of this mise en abyme may be found in the way the film’s visionary picture of scientific progress and urban regeneration can scarcely be matched by any corresponding music of the future.